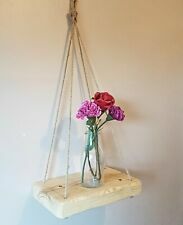 Each shelf is sanded to a really smooth 240 grit finish then finished with a beautiful shabby chic pink stain,leaving a beautiful finish. The finished size of the shelf is (approx). 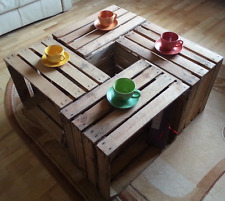 The finished size of the shelf is (approx). 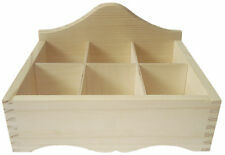 Each shelf is sanded to a really smooth 240 grit finish leaving a beautiful smooth finish. 6 Strong&Solid Vintage Wooden Fruit Apple Crates Boxes Ground and Cleaned! Match or suits with any furniture in room. Easy Wipe Cleaning. 6 Wooden Crates Fruit Apple Boxes Vintage Home Decor Cleaned Vintage Style! They fit great to a living room as a bookshelf, you can easily place your TV on them. 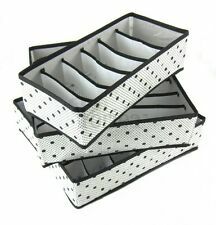 They are perfect to use as a storage box or to keep your fruits or vegetables in them. The only thing that limits their use is your own imagination. STYLISH ITALIAN DESIGN, UK STOCK & TRUSTED SELLER !! 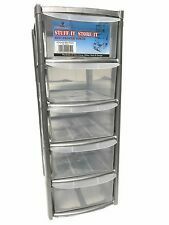 5 Tier Ladder Style Shelf Unit. 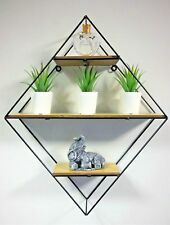 Perfect for use as a book shelf, display unit or bathroom rack. Great for practical storage such as bathroom towels/toiletries or kitchen utensils/cook books. Stylish storage solution for any room in the house. This beautiful contemporary 2 tier bookcase is suitable for the living room, dining room, bedroom, study or office. We will then advise you on resolving this issue, through repair where necessary. Size: W30 x D23.5 x H53.6cm. Garland 6 Tilt Drawer Cabinet. 1 x Garland 6 Tilt Drawer Cabinet. • Wall mountable. The cabinet can interlock on all side, so it can easily be extended. Made from tough and durable plastic, it will last for years. The tin has a removal lid with black print Tin of Denial. Bright Side Receipts Tin. Beautiful Large Sized Round Laundry Basket. The Colour is As Shown In The Picture. Arpan White 2 Drawer unit. Size For 2 Drawer unit - 18x25x33cm approx. 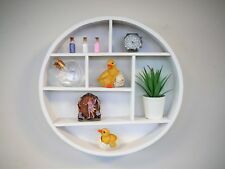 Mount in a child's room, bathroom, kitchen or pride of place in a living room or office. The design itself consists of 7 separate shelf areas, making for a quirky addition to the usual plain shelving. Hartleys 4 Tier Ladder Shelf. No assembly required, simply fold open. Brown wood effect finish. Height: 140cm. This range can also be used for many other storage needs; toy basket for teddies in your child’s nursery or the smaller baskets can even be used for odd bits around the house i.e. in the kitchen & Bathroom. JVL White Woven Drawer Tower Unit. Rope handles on the unit allow easy access in to the drawers even when your hands are full. The Perfect Storage Solution For Small Household Bits and Bobs with Its Spacious Cupboard and Two Small Drawers. Very Stylish and On Trend Shabby Chic Distressed Finish. Gorgeous Rustic Style Cabinet. 10,12 Strong&Solid Smaller Storage Wooden Crates Fruit Apple Boxes - CLEAN ! One can never have too much of storage space, regardless if it's in the bathroom, kitchen or hallway. This bamboo rack stands out with its unique structure and natural material. Use the all-rounder shelf as a bookshelf, bathroom rack, kitchen shelf or more. The Bellini 2 Door Shoe Cabinet with 7 Shelves provides an effective way of keeping shoes tidy. Dark Walnut - Dark wood veneer. Walnut - Natural wood veneer. With two smooth opening doors which reveal 7 height adjustable shelves. 4 maize baskets with inset handles. Maize baskets are all a grey colour. The maize drawers have removable fabric linings. 4 Maize baskets. Ideal for the bathroom, bedroom, hallway. Each basket can take a max of approx 3-4kg. Eliminate clutter and make any room more organized with this versatile 9 Cube Storage Unit. 9 Cube storage unit. Can accommodate fabric storage cubes (Not included). Sign-up to Deal Alerts!